once you know the best strategies. The added confidence is great, too. Throughout their career at Mt. Helix Academy, students are carefully taught the procedures of school, including skills as diverse as getting the teacher’s attention, turning in assignments, and walking in the halls as a member of the class. We also take great care to teach our students important study and organization skills that will help them to be successful, confident students. 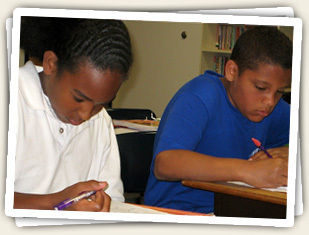 They are taught how to organize their time and their learning space, and how to study most effectively. Mt. Helix Academy Kindergarteners, first and second graders are taught how to organize their materials, maintain their home/school folders, and fill in their homework logs. Beginning in third grade, our students are taught specific organization and study strategies for successful self-management across the curriculum. For example, we teach them how to efficiently and effectively organize their binders section by section, maintain their assignment calendars, complete their long-term assignments, proofread and edit their written work, memorize important information, take notes during lectures, outline oral and written information, and how to take tests. Because they are effectively taught the strategies necessary to be well-organized and successful, Mt. Helix Academy students become very self-confident, enjoy learning, and build self-management skills that support personal success throughout their lives. Our graduates frequently report that the strategies learned at Mt. Helix Academy have allowed them to make an easy and successful transition into high school.